As a horse owner, you are confronted with a daunting selection of horse wear, including blankets and sheets of all styles and sizes, for a myriad of purposes. The sweat sheets -- or more appropriately anti-sweat sheet -- not only is a practical garment for your horse, but can be essential to his health. Anti-sweat sheets have two primary characteristics that combine to distinguish it from other sheets. First, the sheet is lightweight, and second, it is made of a material that wicks away, or soaks up, moisture from your horse. Sheet manufacturers typically use cotton, or a cotton blend, knitted into a mesh so that the blanket “breathes” through the ventilating weave of the fabric. Irish knit is a very common material used in these sheets. An anti-sweat sheet won't prevent your horse from sweating. Rather, it will absorb the sweat after a workout so he's dry before you turn him out or put him up for the night. 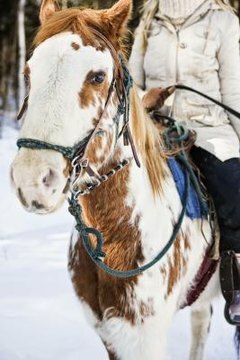 This keeps your horse from getting chilled; if he is bathed in sweat and the outside temperature is cool, his body cannot regulate his temperature properly. Check the sheet periodically, as once it gets saturated you will need to replace it with another if he’s still not dry. Your horse is not as likely to need an anti-sweat sheet in warm weather, but using one to dry him before turning him out can prevent him from rolling, keeping him cleaner. Use an anti-sweat sheet whether or not your horse has been body clipped. If he has his natural winter coat, he won’t be able to regulate his body temperature very well in the cold weather when he’s sweaty, so make sure he’s completely dry before you turn him back out. If he’s body clipped, he is even more prone to chills while the sweat is drying, so the sheet gives him a bit more protection. Plus, a body clipped horse in winter must be blanketed, and you can’t put his heavier winter blanket on him until he’s dry or the moisture will get trapped underneath it. That trapped moisture under a heavy blanket can irritate the skin and lead to infections, as well as interfere with his normal body temperature. Since anti-sweat sheets don’t provide much warmth, you may want to layer a cooler on top of the sheet after you work your horse on cold days. Coolers are sheets that are slightly heavier, but they also wick moisture away from your horse. They typically are made from wool or a fleece material. When your horse is dry, remove both the sheet and cooler, and replace them with his winter blanket.